Slang Design is proud to announce the first new PDF-only supplement for Base Raiders. Get your copy today! Product Description: The only thing more dangerous than a dirty cop is a superpowered dirty cop! Agent Grayson’s greed for power and wealth is only exceeded by his ego. He has secretly injected himself with super soldier drugs so he can better exploit his position as a federal law enforcement agent. When he isn’t investigating vigilante heroes or base raiders to improve his career, he’s robbing and killing them in secret. 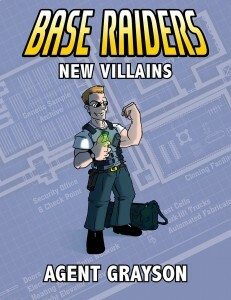 This PDF contains a full write up of Agent Grayson, a new villain for the Base Raiders RPG. It includes his background, full stats, his tactics and weaknesses, and a scenario seed featuring Grayson as an antagonist. Buy it now at DrivethruRPG or our store.